I am sad to be writing my last blog post for my summer position here at the OLCS. This past week I have been working hard to wrap up all the projects from the summer including my last water sampling on Wednesday. On Tuesday, Jim and I attended the Clean Foundation’s regional debrief session for the Youth Corps in Truro. At this event, I had the opportunity to provide a small presentation outlining the different projects I had been working on all summer for the OLCS, as well as listen to other students from across the province talk about their own projects. I have finished my list of wildlife species I encountered around the lake this summer. By no means is this a complete list of ALL the wildlife species, instead it is a small sampling that I encourage many of you to expand on with your own sightings around the lake. With the completion of the invasive species removal last week, I have had more time this week to focus on finishing up the educational resources I have been working on. 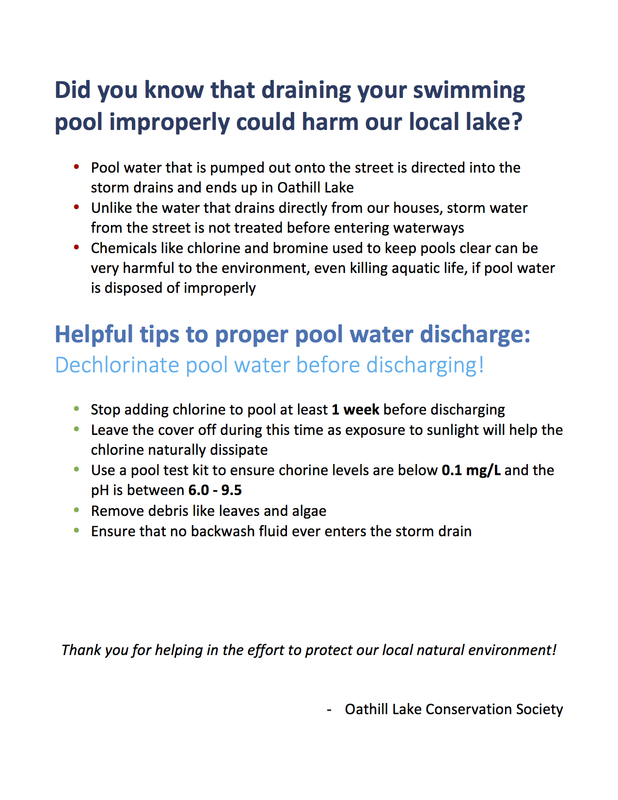 This includes a letter I have written that can be distributed to newcomers of the community introducing who the OLCS is, as well as providing some helpful tips on how they can contribute to the conservation efforts at the lake. 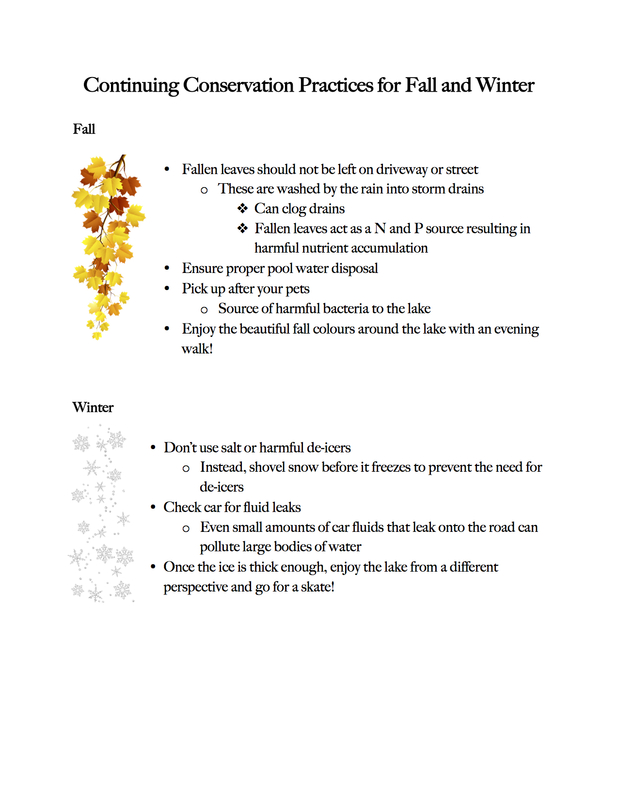 Building off the success of the drain decals that were installed by Halifax Water last week, I have continued with the theme of safe storm water practices and composed a brief information sheet on the importance of proper pool water disposal. Disposing of pool water safely is easy and prevents harmful chemicals from being introduced to the lake. If you or someone you know has a pool, I encourage you to take a look at the page to ensure you are following these practices! 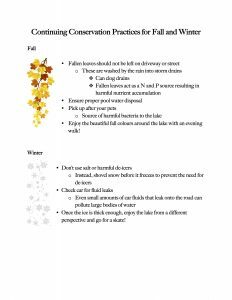 Finally, before I say goodbye I am leaving you with an information sheet providing conservation tips that you can carry on throughout the fall and winter. 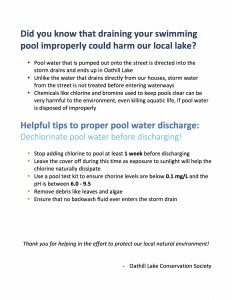 As the summer season is coming to an end, it is important to remember that although we may not be swimming in the lake anymore that it is still just as important to ensure we are keeping the lake clean and healthy for the wildlife that inhabits it. I cannot thank you enough, the members of the OLCS, for your continued support and involvement in all the projects I have been working on this summer. It has been so fun and rewarding to participate in your society and help a lake that had been such a big part of my childhood.